During the four years that Father Xavier and I shared the rectory, I don’t think either of us apologized once. We didn’t need to—we were close in age and of similar habits in the house. With Father Paul it’s a whole different story. We’re apologizing all the time! He says he’s sorry for eating at breakfast the lasagna I’d planned to serve for dinner, and I say I’m sorry for yelling when I found the empty dish. But it’s really not apologies that makes us get along so well; it’s mercy. Mercy is the fuel of forgiveness. Without it, no marriage, no family, no friendship can really thrive. Mercy is the compassion and understanding that even precedes the act of forgiving. Yet mercy is a rather unfamiliar word. We use it very casually. People speak about “mercy killing,” basketball has “mercy rules,” and there was even an old joke about the man who killed his parents placing himself on the mercy of the court—since he was an orphan. Only at Mass do we seem to use the word seriously. We pray “Lord, have mercy, Christ have mercy” in a prayer even older than the Latin liturgy. St. John Paul designated this second Sunday of Easter as the Sunday of Divine Mercy. 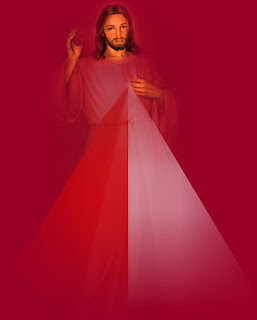 He called Divine Mercy “the Easter gift that the Church receives from the risen Christ and offers to humanity (Divine Mercy Sunday Homily, April 22, 2001). Let’s think about why he did that, and about what we mean when we ask the Lord for mercy every Sunday. In the first place, today’s Gospel highlights three things; we need all three to celebrate fully God’s mercy today. The first is peace. Three times Jesus says “peace be with you” to his disciples and to us. Peace is a fruit of mercy. Mercy frees us from fear—from hopelessness and anxiety about our failures and weaknesses. Haven’t you experienced the beautiful feeling of peace that comes when a loved one forgave some wrong you did? It lifts an enormous weight off your shoulders. At the beginning of every Mass we ask for mercy. Towards the end of every Mass Christ offers us peace. There’s an important connection there that we should not miss. The second thing that stands out in today’s Gospel is the forgiveness of sins. And it’s no accident that our reading from Acts is about the Apostles healing people. The Risen Lord gave a mission to his Church, and he equipped it with power—demonstrated by physical miracles but primarily for the eternal saving of souls. So much happens in the today’s Gospel that we can fail to notice that Jesus has just instituted the Sacrament of Penance! The Church teaches that Jesus did this at the moment when he breathed on the disciples and said “Receive the Holy Spirit. If you forgive the sins of any, they are forgiven them; if you retain the sins of any, they are retained” (Council of Trent, Session 14). Today deserves the title Sunday of Divine Mercy for this fact alone. The peace that Jesus offered to the frightened few huddled behind closed doors is now offered to every sinner. Our penitential services this Lent were well attended, and we have a steady flow of people at confession each week. But far fewer celebrate this sacrament than come to Mass, which worries me—not because I think there’s a score of hardened sinners in the congregation, but because the gift of God’s mercy is for all. I sent a text to a priest friend yesterday: “Come and help me with my homily and will give you a good lunch.” He came happily. After the lunch—which was good—he said “okay, how can I help you with the homily?” I said “Bless me, Father, for I have sinned…” and went to confession! Because I practice what I preach about this great sacrament of mercy. The third thing that jumps out at us from the pages of the Gospel today is faith. The Scriptures today proclaim that Jesus forgives sins, heals infirmities and gives peace. But these gifts require something on our part—faith. Not a perfect and unwavering faith, but a faith that reaches out to Jesus. Jesus tells Thomas to touch him, but it is really Jesus who touches Thomas. The doubting apostle stretches out his hand and fingers, but Jesus gives faith to his heart. Some of us may also have doubts, but there is no risen Christ standing before us. What do we do? Like Thomas, we might want to try reaching out to Jesus—perhaps by celebrating the Sacrament of Penance for this first time in a long while, even if we’re not fully convinced we need mercy or that Jesus will show us mercy. If mercy is a foreign word to you, perhaps you might come to church on Friday evening. Father Raymond de Souza—a keen intellect and a popular writer—will be with us for a one-night “Mission of Mercy,” and will share his thoughts on why mercy matters so much to each of us.